2016 Training Program at Richards Bridge. 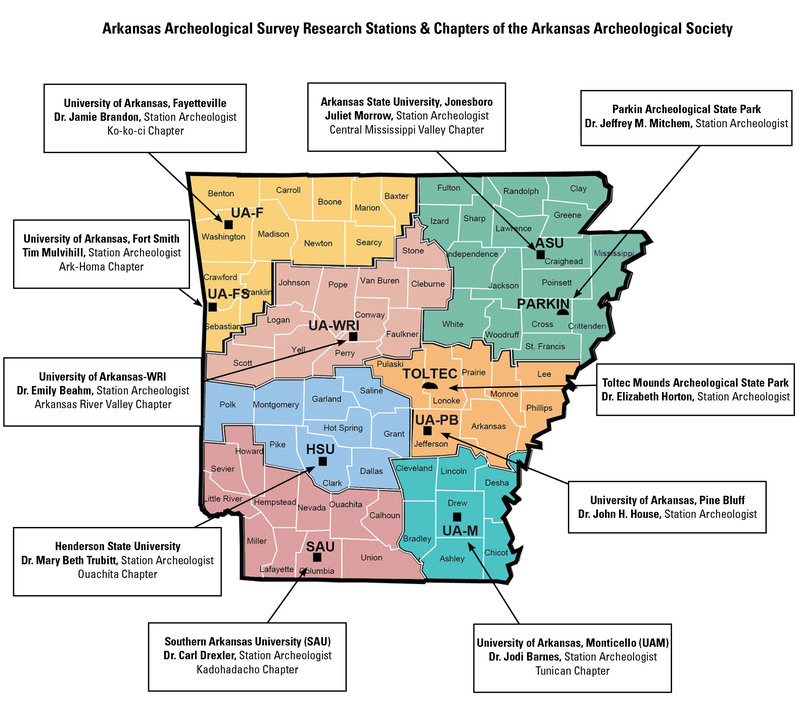 The Arkansas Archeological Survey (ARAS), a unit of the University of Arkansas System, consists of a Coordinating Office in Fayetteville and ten research stations around the state. It shares a close working relationship with the Arkansas Archeological Society, a network of citizen volunteers concerned with learning about and preserving Arkansas cultural heritage. Our mission is to study and preserve Arkansas’s past and to share what we learn with the public. Arkansas has significant archeological resources spanning a 12,000 year record of history, ranging from the bluff shelters of the Ozark Mountains to the extensive mound complexes of the Central Mississippi River Valley. Although the ARAS, along with citizen volunteers and local, state, and federal partners, campaigns for archeological education and preservation, our state’s sites and the archeological record face continued threats from development, agricultural land-leveling, and looting. Education is a way to help protect Arkansas’s archeological heritage. We hope this curriculum expands students’ content knowledge of the important contributions that southeastern Indians and European, African, and early American populations made to Arkansas history. We also hope it fosters a greater sense of the importance of preservation among teachers and their students. Visit the Arkansas Archeological Survey’s web page for more information about archeology in Arkansas and to find your local archeologist.